Today, Oregon Governor Kate Brown sent out a media release announcing she has signed House Bill 2655 into law. This is welcome news, and expands the rights of students & parents to opt-out of high-stakes testing. Some elements here have us concerned, though. As educators and policy makers, it is important to demonstrate for parents the connection between high levels of student participation in assessment and system accountability – ensuring the success of every student. The success of the national opt-out movement is based almost entirely on parents, students, and many teachers knowing education and what’s best for students far better than policy makers. As we have posted before, high-stakes testing is not a realm of reason. It is a hostage situation. The stakes and expenses will simply increase, to the detriment of students, the more the high-stakes testing culture is appeased. It is well-past time for this practice to stop. Gov. Brown’s action represents an important step forward in expanding parent & student rights. However, much education of policymakers remains to ensure we stop tossing our funds and students’ futures down the high-stakes testing sinkhole. ← How much of this anti-teacher stuff is anti-women? District to schools: Hide opt-out forms! Nuance the messaging! Hit quota! 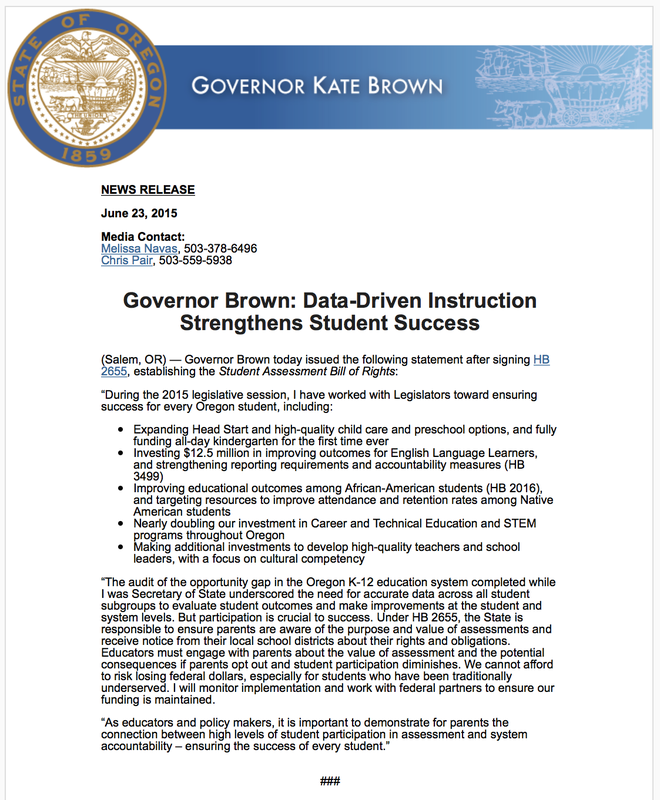 Rachel Rich to Oregon Legislature on SBAC Testing: Kill It. State employee who sold Oregon on SBAC got a job at SBAC!